Beauty from the inside out, on a physical level, is directly connected to what foods we put in our body. Natural whole foods all play a miraculous role in our overall wellbeing. I’m that person who notices the connection between people’s skin complexion and what they’re eating – it is the biggest giveaway to whether they’re eating a diet of real foods or junk foods. What we eat will inevitably come through our skin – and if we’re eating a colorless diet, our skin will most likely appear pale and colorless; if we’re eating a diet rich in unhealthy fats and fried foods, our skin will react with a buildup of grease and acne. It’s simple. What we eat affects our skin health. If you’re looking for a beautifully clear and healthy complexion, one of my favorite beauty foods is wild-caught salmon. I eat it weekly to boost natural beauty. 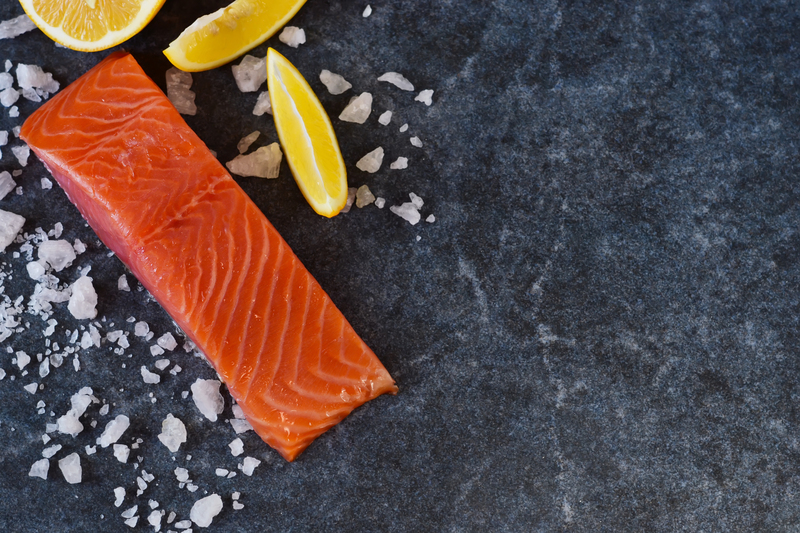 Whether you’re a big meat eater or you stick to a plant based diet, salmon can be a beloved beauty food, with its light but well-rounded protein content. Always choose wild Alaskan sockeye salmon over farmed salmon. Farmed salmon poses a list of challenges, containing a variety of toxins including antibiotics, dioxins, heavy metals, pesticides, and polychlorinated biphenyls (PCBs). Salmon is an anti-inflammatory food, which means it drastically improves skin health since most skin issues are rooted in inflammation. And when we have skin issues that means there’s inflammation in our bodies that is causing other issues we can’t always see on the surface, like we can see on our skin. When we’re eating salmon for beauty, we’re healing other parts of our body, too. Wild salmon carries one of the highest omega-3 fatty acids contents than any fish, which directly lowers inflammation in the skin and body, and protects against oxidative damage. Selenium is important for skin, hair and nails, which is also found in wild salmon – when we’re not getting enough of it, everything will appear dull instead of rich and shiny. A study concluded that Astaxanthin, a type of carotenoid found in wild salmon, combats free radicals to keep skin young, bright and healthy – and when applied topically, improves wrinkles, age spots, and skin texture. One of my favorite facial oils containing this brilliant ingredient is the Maya Chia Super Couple. Wild salmon combined with a natural skincare routine is one of the best ways to get brighter skin fast. I want to make it easy for you and include one of my favorite simple salmon recipes right now. If you don’t have access to fresh salmon, sometimes a can will do the trick. Check out the Environmental Working Group rankings to find the best brands.